Speaking of sea monsters... the kraken (Norse krakka or legendary hafgufa), is an interesting sea monster of ancient times that has been greatly misrepresented in books, television and films. The confusion comes from the cultural translation of the name. Digging through the etymology, the original reference to the monster is from the Norse Vikings, referring to it as the "krakka," a noun derived from a combination of krabbe (crab) and the verb meaning, "to drag under." But, since Vikings did not write many books and Germans did, they expressed krakka as the word as "krake," which means "octopus" (made sense for something in the ocean). From this point on, the Kraken (German for "the krake") has had the incorrect octopod description. KONGE-SPEILET: ET PHILOSOPHISK DIDAKTISK SKRIFT FORFATTET I NORGE MOD SLUTNINGEN AF DET T0LFTE AARHUNDREDE, p. 32 (translated) wrote: There is a fish that is still unmentioned, which it is scarcely advisable to speak about on account of its size, because it will seem to most people incredible. There are only a very few who can speak upon it clearly, because it is seldom near land or appears where it may be seen by fishermen, and I suppose there are not many of this sort of fish in the sea. Most often in our tongue we call it hafgufa. Nor can I conclusively speak about its length in ells [cubit, about 18"], because the times he has shown before men, he has appeared more like land than like a fish. Neither have I heard that one had been caught or found dead; and it seems to me as though there must be no more than two in the oceans, and I deem that each is unable to reproduce itself, for I believe that they are always the same ones. Then too, neither would it do for other fish if the hafgufa were of such a number as other whales, on account of their vastness, and how much subsistence that they need. It is said to be the nature of these fish that when it shall desire to eat, then it stretches up its neck with a great belching, and following this belching comes forth much food, so that all kinds of fish, that are at hand will come to present location, then will gather together, both small and large, and that believing they shall obtain there food and good eating; but this great fish lets its mouth stand open the while, and the gap is no less wide than that of a great sound or fjord, And nor may the fish avoid running together there in their great numbers. But as soon as its stomach and mouth is full, then it locks together its mouth and has them all caught and enclosed, that before greedily came there looking for food." Pontoppidian (18th century account, translated) wrote: But the largest of the star-fish kind is that sea monster called kruken, kraken or krabben. Bochart, says our author, might with reason say, Lib. I, cap. 6, with Oppian. Halieut, cap. 1. In mare multa latent, i.e. In the ocean many things are hidden. Amongst the many great things which are in the ocean, and concealed from our eyes, or only presented to our view for a few minutes, is the kraken. This creature is the largest and most surprising of all the animal creation, and consequently well deserves such an account as the nature of the thing, according to the Creator's wise ordinance, will admit of. Such I shall give at present, and perhaps much greater light in this subject may be reserved for posterity, according to the words of the son of Sirach, "Who hath seen him, that he might tell us? and who can magnify him as he is? There are yet hid greater things than these be, for we have seen but a few of his works." Eccles. chap. xliii, ver. 31, 32. Our fishermen unanimously affirm, and without the least variation in their accounts, that when they row out several miles to sea, particularly in the hot summer days, and by their situation (which they know by taking a view of certain points of land) expect to find 80 or 100 fathoms water, it often happens that they do not find above 20 or 30, and sometimes less. At these places they generally find the greatest plenty of fish, especially cod and ling. Their lines they say are no sooner out than they may draw them up with the hooks all full of fish; by this they judge that the kraken is at the bottom. They say this creature causes those unnatural shallows mentioned above, and prevents their sounding. These the fishermen are always glad to find, looking upon them as a means of their taking abundance of fish. There are sometimes 20 boats or more got together, and throwing out their lines at a moderate distance from each other; and the only thing they then have to observe is, whether the depth continues to be the same, which they know by their lines, or whether it grows shallower by their seeming to have less water. If this last be the case, they find that the kraken is raising himself nearer the surface and then it is not time for them to stay any longer; they immediately leave off fishing, take to their oars, and get away as fast as they can. When they have reached the usual depth of the place, and find themselves out of danger, they lie upon their oars, and in a few minutes after they see this enormous monster come up to the surface of the water; he there shows himself sufficiently, though his whole body does not appear, which in all likelihood no human eye ever beheld (excepting the young of this species, which shall afterwards be spoken of;) its back or upper part, which seems to be in appearance about an English mile and a half in circumference (some say more, but I choose the least for greater certainty) looks at first like a number of small islands, surrounded with something that floats and fluctuates like sea-weeds. Here and there a larger rising is observed like sand-banks, on which various kinds of small fishes are seen continually leaping about till they roll off into the water from the sides of it; at last several bright points or horns appear, which grow thicker and thicker the higher they rise above the surface of the water, and sometimes they stand up as high and as large as the masts of middle-sized vessels. It seems these are the creature's arms, and, it is said, if they were to lay hold of the largest man of war, they would pull it down to the bottom. After this monster has been seen on the surface of the water a short time, it begins slowly to sink again, and then the danger is as great as before; because the motion of his sinking causes such a swell in the sea, and such an eddy or whirlpool, that it draws every thing down with it. As this enormous sea-animal in all probability may be reckoned of the polype, or of the star-fish kind, it seems that the parts which are seen rising at its pleasure, and are called arms, are properly the tentacula, or feeling instruments, called horns as well as arms. With these they move themselves, and likewise gather in their food. Besides these, for this last purpose the great Creator has also given this creature a strong and peculiar scent, which it can emit at certain times, and by means of which it beguiles and draws other fish to come in heaps about it. This animal has another strange property, known by the experience of a great many old fishermen. They observe, that for some months the kraken or krabben is continually eating, and in other months he voids his excrements. During this evacuation the surface of the water is coloured with the excrement, and appears quite thick and turbid. This murkiness is said to be so very agreeable to the smell or taste of other fishes, or to both, that they gather together from all parts to it, and keep for that purpose directly over the kraken: He then opens his arms or horns, seizes and swallows his welcome guests, and converts them, after the due time, by digestion, into a bait for other fish of the same kind. I relate what is affirmed by many; but I cannot give so certain assurances of this particular, as I can of the existence of this surprising creature; tho i do not find any thing in it absolutely contrary to nature. As we can hardly expect an opportunity to examine this enormous sea animal alive, I am the more concerned that nobody embraced that opportunity which, according to the following account, once did, and perhaps never more may offer. The Rev. Mr. Friis, consistorial assessor, minister of Bodoen in Nordland, and vicar of the college for promoting Christian knowledge, gave me at the latter end of last year, when he was at Bergen, this relation; which I deliver again on his credit. In the year 1680 a krake (perhaps a young and careless one) came into the water that runs between the rocks and cliffs in the parish of Alstahoug, though the general custom of that creature is to keep always several leagues from land, and therefore of course they must die there. It happened that its extended long arms, or antennæ, which this creature seems to use like the snail, in turning about, caught hold of some trees standing near the water, which might easily have been torn up by the roots; but beside this, as it was found afterwards, he entangled himself in some openings or clefts in the rock, and therein stuck so fast, and hung so unfortunately, that he could not work himself out, but perished and petrified on the spot. The carcase, which was a long while decaying, and filled great part of that narrow channel, made it almost impassable by its intolerable stench. The kraken has never been known to do any great harm, except they have taken away the lives of those who consequently could not bring the tidings. I have never heard but one instance mentioned, which happened a few years ago near Fridrichstad, in the diocese of Aggerhuus. they say that two fishermen accidentally, and to their great surprise, fell into such as spot on the water as has been before described, full of thick slime, almost like a morass. They immediately strive to get out of this place, but they had not time to turn quick enough to save themselves from one of the kraken's horns, which crushed the head of the boat so, that it was with great difficulty they saved their lives on the wreck, tho the weather was calm as possible; for these monsters never appear at other times. It seems that the kraken has more in common with a starfish or perhaps crab (krabbe) than an octopod or decapod. The size is enormous--expressed as a circular island of 1-2 miles (1.6-3.2 km) in diameter. The one described above had a diameter of about a half mile, 762m, the size of 7 American football fields. As the texts indicate, fishermen were well aware of kraken, as they provided an opportunity for a bountiful harvest. Checking for other reports from seamen and whalers, one finds many references to disappearing or floating islands--most likely a kraken that is in its feeding cycle. The island disappears when it sinks again to the bottom. Locations are world-wide, but they seem to prefer the colder waters. In more recent times, there are many reports of "massive, circular USOs" (unidentified submerged objects) that are seen just below or on the surface (as the fishermen describe), which may also be kraken sightings. I also suspect that since deep ocean creatures are often bioluminescent, many of these large, circular lights that appear under the ocean may also be of the kraken class. Hard to tell, as I doubt marine scientists will every be able to capture and study a creature of this size. Firstly, let me clear up some misconceptions that were put forth on the video and show up on this image. The striped bands are hi-def sonar sweeps from a ship above, which were added to the existing low-res image to improve clarity. These are not any kind of "phenomena"--just detailed imaging from sonar (easy to tell, as the pixel resolution is so much higher than the surrounding regions. These hi-def sonar sweeps do have some inaccuracies. They use a stereoscopic system to get accurate depth and a data error is generated where the sweeps intersect--leaving a "line" down the middle of the path that isn't actually there. Also, as they fan out side-to-side, resolution decreases and you get the linear texturing, making it appear as something went rolling across the ocean bottom. These are artifacts and not what is actually on the bottom (which is probably smooth). The kraken is the circular blob on the top right, moving slowing across the bottom, leaving a trench from its mass. It is approximately 2 miles (3.2km) in diameter. Pushing 500 miles here, before I lost it in a "low resolution" region of the Pacific. It appears to be following the Alaska current, avoiding mountains and chasms. The Norse accounts indicate that the krakka may only feed every several years, which is consistent with the low metabolic rate of deep ocean creatures that live in oxygen-depleted regions and sub-freezing temperatures (also, gigantism is common down there). Just lucked out on this one, as the hi-def sonar happened to go right over the top of it. Reminds me a bit of Kroll on Doctor Who. In the episode (The Power of Kroll), Kroll was one of those creatures that lay dormant for decades and produced methane as part of its feeding process. Curiously enough, the ocean floor contains pockets of methane that get released during earthquakes, causing boats to sink and planes to crash. Or, perhaps, it is just kraken farts... dang, more greenhouse gas... as if cows weren't enough! Speaking of sea serpents and cows... here's a nice "coincidence" for you... I had the TV on the other night while sorting some photos and I can't even recall what the show was, a war documentary I think, anyway it went off into a segment all about HMS Hilary and Captain F.W. Dean who in May 1017 off the coast of Iceland saw and reported a huge sea serpent like creature with a black and glossy head a bit like a cow. It raised it's 20ft neck and they shot at it so naturally it quickly vanished. 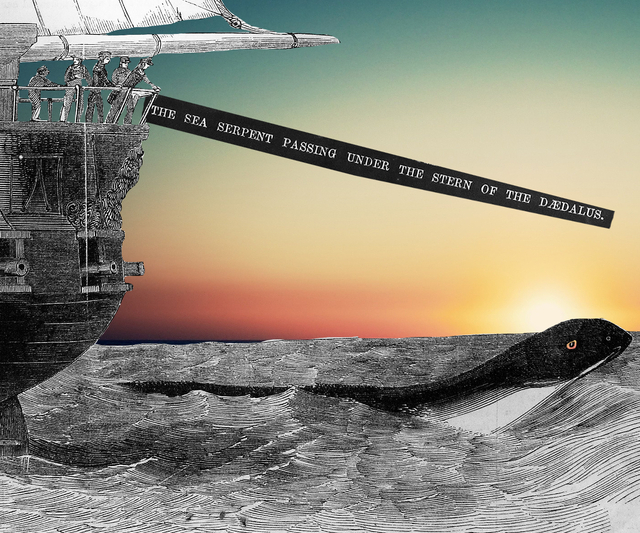 The story of Hilary sighting of a sea serpent was published in the shape of a letter in the scientific journal Nature in 1930 and is presented as “an important piece of evidence for the existence of the creature populary called the sea serpent”. 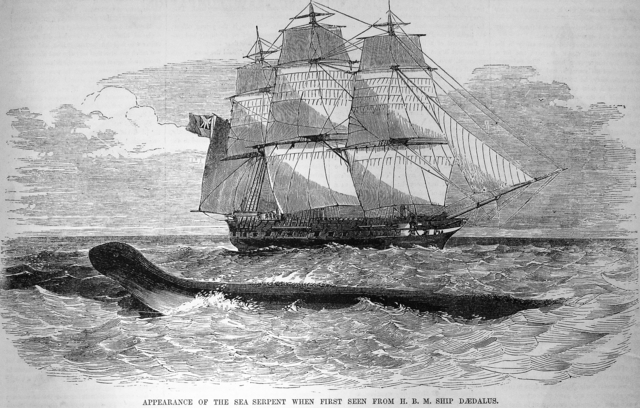 Nature writer adds that “three independent estimates made on board the ‘Hilary’ gave a length of the neck of the ‘sea serpent’ (head to dorsal fin) as 15 feet or more, 20 feet and 28 feet. The head appeared to have a patch of whitish flesh in front, like that around a cow’s nostrils. The dorsal fin was thin and flexible, occasionally curving over at the top. The ‘Hilary’ being on patrol at the time, the unfortunate creature was used as a target for anti-submarine practice with the 6-pounders, at about 1200 yards range. A direct hit having apparently scored, it disappeared, no trace remaining. A few days later (May 25, 1917) the ship was torpedoed and sunk, taking with her all logs, journals, etc. recording the ‘sea serpent’ incident. 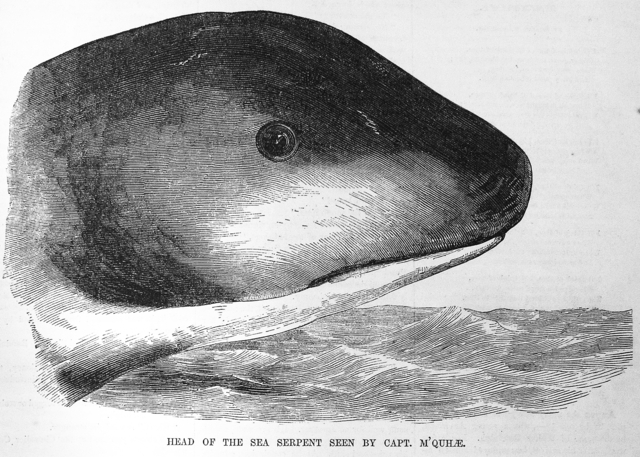 As described the creature seems to have borne a most striking resemblance to that seen off the Brazilian coast, in December 1905, from the Earl of Crawford’s yacht ‘Valhalla’ (see Nature, June 28, 1906, p. 202). ...meaning they do but they aren't specifically filed under sea serpent! "This much is beyond dispute: that on the afternoon of 31 July 1915, in the first year of the First World War, the British steamer Iberian was shelled, torpedoed and sunk off the coast of Ireland by the German submarine U28. This much is disputed: that when the Iberian went down, there was a large underwater disturbance – caused, it is supposed, by her boilers imploding. Quantities of wreckage were hurled into the air, and there, amid the debris, six members of the U-boat's crew beheld "a gigantic sea-animal, writhing and struggling wildly", which "shot out of the water to a height of 60 to 100 feet." [Source: Bernard Heuvelmans, In the Wake of the Sea Serpents (London: Rupert Hart Davis, 1968) p.395] "